Everyone knows charities help people solve problems in the world. However, over the past few years the business of doing good has become more market-driven. Suddenly, there is competition from private companies with a social purpose, often more adept at distilling a simple and compelling consumer proposition. The result is that charities no longer hold the monopoly on doing good. More and more people can satisfy their sense of social purpose without signing up as a card-carrying charity supporter. What does this mean for the sector’s financial future, or capacity to bring about systemic change? 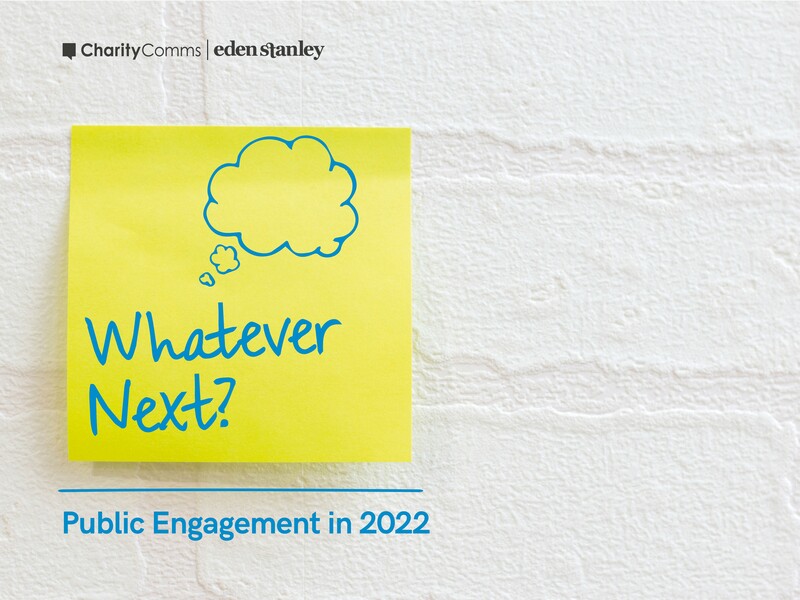 A few months ago, CharityComms and Eden Stanley were approached by the head of strategic communications from a large international charity, tasked with figuring out what public engagement might look like for them in five years. They saw an opportunity, and approached me to help them develop the report Whatever Next? Public Engagement in 2022. It’s a resource for the whole sector to use as we enter a foggy new future, filled with uncertainty about how the next generation of supporters will engage with charities. The report is a mixture of in-depth desk research to find trends in demographics, behaviours, technology, and media as well as discussions with people at the leading edge of public engagement, from the charity sector and beyond. Many thanks to all of them for their time and insights. What came over loud and clear is that for charities to continue successfully engaging supporters – as donors, volunteers, activists and networkers – the sector will need to develop new propositions to keep up with changing attitudes and expectations. We’ve got to be brave and honest about why some people support us (and why others don’t), and how their support makes a difference. How will your charity respond to changing times? And if you’re still figuring that out, where will you start? I hope the facts, stats, trends, thoughts, charts, examples, quotes, ideas and tips in this report will provide food for thought to help you find the right answer for you. Download a copy of Whatever Next? Public Engagement in 2022.